related to an answer for: Question about 192 and dp 88 accessing all 16 inputs at 96khz. Correct, if you wanted 24 analog inputs, you would need another dp 88 using another cable, running at 44 or 48. 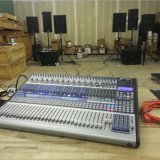 Question about 192 and dp 88 accessing all 16 inputs at 96khz. Can only get channels 1 - 8 to playback on a 16.0.2, not the dual channels. How can I get playback to the headphones channel (1 or 2) instead of just the "main out" channels? Audiobox 22vsl midi channels work in Mixcraft 8 but Channels 1 and 2 do not seem to be sending any signal. What about the Word Clock? Do I need 2 BNC cables? This is very unclear.